Home Inspection Services of Michigan, Inc. Thank you for visiting out site! If you are a current customer and wish to see your home inspection please click on the "Sample Inspections" menu button. If you are a new customer, we hope that the information we have provided on this site is helpful. 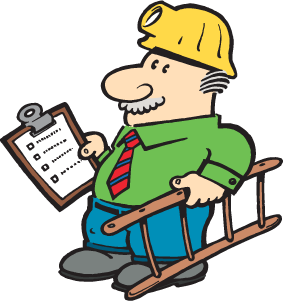 A home inspection is a visual examination of the physical structure and systems of a home. If you are thinking of buying a house, co-op or condominium, you should have it properly inspected before the final purchase by an experienced and impartial professional home inspector. The purchase of a home is probably the largest single investment you will ever make. You should know exactly what to expect, both indoors and out, in terms of repair and maintenance and their costs. A fresh coat of paint could be hiding serious structural problems. Water marks in the basement may indicate a chronic seepage problem of may be a single incident. The home inspector interprets these and other clues, then presents his professional opinion as to the condition of the property before you buy, so you can avoid unpleasant surprises afterwards. Of course, a home inspection will also point out the positive aspects of a home, as well as the type of maintenance that will be necessary to keep it in good shape. After the inspection, you will have a much clearer understanding of what it is you are about to purchase, and you will be able to make your decision confidently. When do I call in the home inspector? The best time to call in the home inspector is after you've made an offer on the house, and before you sign the contract. Or you can ask your lawyer to include an inspection clause in the contract, making your purchase obligation contingent upon the finding of a professional home inspection. It's not necessary for you to be present for the inspection, but it is a good idea. By following the home inspector around the house, by observing and asking questions, you will learn about your new home and get some tips on maintenance in general – information that will be of great help to you after you’ve moved in. If the inspector finds fault in a home it doesn't necessarily mean you shouldn't buy it, only that you will know in advance what type of repairs to anticipate. A seller may be willing to renegotiate the purchase price because of significant problems discovered in an inspection. If you don't wish to become involved in future repair work, you may decide that this is not the house of you. The choice is yours. An ASHI Standards inspection includes a visual examination of the house from top to bottom. The inspector examines the heating system, the central air conditioning system (when temperature permits), the interior plumbing, and electrical systems, the roof and visible insulation, walls, ceilings, floors, windows and doors, the foundations, basement and visible structure. Can't I do it myself? Even the most experienced homeowner lacks the knowledge and expertise of a professional home inspector who has inspected hundreds, perhaps thousands of homes in his career. An inspector is equally familiar with all the elements of home construction and with the proper installation, maintenance and interrelationships of those elements. Above all, most buyers find it very difficult to remain completely objective and unemotional about the house they really want, and this may lead to a poor assessment. If I'm selling a house, is it a good idea to have an inspection prior to listing? Information for proper pricing: A house that's priced right sells faster. Saves the seller anxiety and expense: An impartial inspection report helps to substantiate the selling price or allows the seller to adjust the price to match the condition or make improvements to justify the price. Inspections eliminate last minute delays, unnecessary expense and can provide a marketing advantage. Increases the homes marketability and can reduce the sellers risk of lawsuits for undisclosed defects. Piece of mind for the seller that unknown defects that may threaten his family could be revealed. We will fill out any disclosure statements for the seller. © 2003-18 Home Inspection Services of Michigan, Inc.